As the call of total commitment to God in the Congregation of the Franciscans of Calais in France was answered by many young Irish girls, it seemed time to establish a presence of the Congregation in Ireland. In 1928 two Irish Sisters, Mother de Bethany and Sister Patricia came to Cork in the South of Ireland and rented a house in Boreenmana Road where their work began. In 1931, at the invitation of the Bishop of Cork, Dr. Coughlan, the Sisters moved from Boreenmana Road to the Honan Home in Montenotti in Cork, (see below). The house, with its extensive grounds, had been given to the diocese by the Honan family, prominent business people in the city of Cork. It had been stipulated that “Elderly businessmen, who had lost their wealth, through no fault of their own, and were now living below the poverty line”, were to be housed in this establishment. The Honan family was indeed to be commended in its generosity and sensitivity towards these elderly gentlemen. The task of helping them regain a sense of self-respect again was to be the mission of the Sisters. This they fulfilled with great commitment. It was with great sadness in 1985 due to a shortage of Sisters that the Irish Region handed over its beloved Honan Home to another Congregation. In 1956, the dream of the Irish Sisters was realized when a novitiate was established in Thurnham in England. One year later the first postulant came from Ireland to enter here. Soon, the house was too small to accommodate the number of young women seeking entrance into the formation programme. In 1960, the Sisters found themselves back in Scotland in the border town of Langholm in the County of Dumfriesshire. Over the next ten years many young girls entered the novitiate. On completion of their Canonical year, they went to the novitiate in Desvres for ten months, which all agreed was a very enriching experience. They then returned to Langholm to prepare for profession. The young Sisters went on to study in the field of medical care and education and joined our Sisters in North America, Ethiopia, Djibouti and Ireland. Towards the end of the sixties there was a drop in vocations and it was decided to move the novitiate to Ireland and at the same time sell all the property in Langholm. They now wanted the Sisters to stay and to entrust into their care their sick and their elderly. After much prayer and discernment, it was decided that the Sisters would remain on and in 1970 the new Eventide Home for the elderly was opened. The next twenty-five years saw a total commitment of the Sisters to each of the residents at Erkinholme. It was however the practice of ecumenism which particularly marked this period in the history of the Region. The Sisters seized many opportunities to promote good relations with the local community and the four main churches. Once again the time came for the pilgrim people to move on. New Government Legislation withdrew its financial support to Residential Homes. It was with deep regret that we had to close Erkinholme and sell the property. 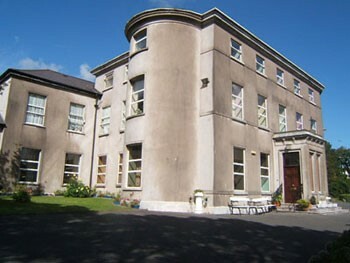 The Novitiate, which was transferred from Langholm to Mullingar in Ireland in 1970, was moved to three other locations in Dublin. In 1979 a hostel for university students at Blair’s Hill in Cork was purchased from the Dominican Sisters. It was felt that more direct contact with the youth might foster vocations. Unfortunately, this was not to be. Ireland was changing rapidly and vocations to the religious life were becoming fewer and fewer. Added to this, with the rising cost of living, hostel accommodation was becoming too expensive and students were opting for “house sharing”. In 1986 the hostel was closed. However, it is hoped that the presence of the Sisters in some way touched the lives of the many student girls living in their midst. Perhaps too the words of St. Peter “Lord it is good for us to be here,” found meaning in their young hearts. In the month of June, 1968, the Franciscan Missionaries of Our Lady, opened the Sacred Heart Nursing Home here in Mullingar. However, in response to the community, the nursing home was soon converted into a hospital and became known as the Sacred Heart Hospital. Later its name was changed to St. Francis Medical Centre. In 1995 with ongoing works it was renamed St Francis Private Hospital. On the 7th January 2010 the sisters took the step of selling the hospital and moving into a purpose built house near-by. It was the vision of the sisters that this house, now called ‘La Verna Centre’, would be opened as a house of Spirituality and Hospitality. Four years on we have now made that dream a reality.